NEW YORK Shares of Pinnacle Foods (PF) soared on Thursday after the maker of Vlasic pickles, Duncan Hines cake mixes and Birds Eye frozen foods made its initial public stock offering on the New York Stock Exchange. The company's stock priced at $20 per share and closed at $22.21. The shares priced at the high end of their expected range of $18 to $20 per share, which suggested healthy demand from investors. 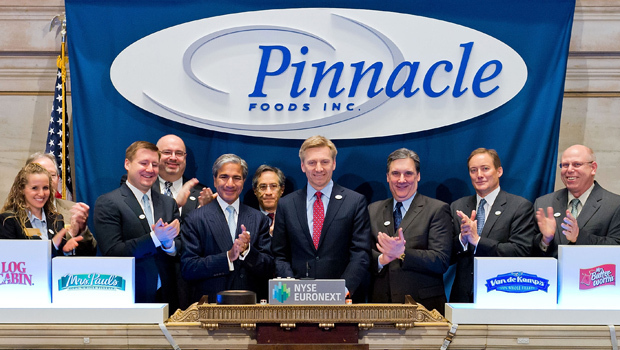 Pinnacle Foods raised $580 million in an initial public offering of 29 million shares. The banks managing the deal may buy another 4.4 million shares to sell, increasing the proceeds for Pinnacle Foods. The Parsippany, N.J., company plans to use proceeds to lower its debt but will still carry about $2.1 billion in debt. Moody's Investors Service put Pinnacle's ratings on review for an upgrade, as the successful IPO could help lower its debt levels. The rating agency currently has assigned Pinnacle a "B2" corporate family rating, which puts it in the middle of junk-grade territory. Pinnacle Foods, which says its products can be found in 85 percent of all U.S. households, reported revenue of $2.48 billion in 2012 and net income of about $52.6 million. Between 2008 and 2012, the company reported sales growth of 59 percent. Private equity firm Blackstone Group (BLK) bought Pinnacle Foods in 2007, and still owns about 70 percent of the company following the IPO.